I've got a number of exciting field training and tour opportunities waiting for you. You can choose from learning camera-trapping in Panama, photographing the jaguars of Brazil's Pantanal. There's even a filmmaking course just for women at the Cocobolo Nature Reserve in Panama. Coming soon is an announcement for an exciting Sahara adventure in beautiful Morocco! Riding camels to a desert oasis? Yes, please! Just $250 reserves your spot. Who says nature filmmaking is for the boys?! There are a lot of talented girls out there (AKA you! ), and we want to help you hone those video skills, so you can rock the epic wildlife storytelling world and share your voices far and wide. So, if you identify as a woman and want to build your wildlife filmmaker chops, join us for a girlventure in Panama, also at the Cocobolo Nature Reserve. The uber talented Jenny Nichols (Pongo Media) and I will lead you as you work in small teams to create a wildlife film from start to finish. Here, you'll learn that even wildlife stories include human ones, or you can try your hand at straight up natural history. We'll even throw a mini film festival at the end! The filmmaking industry and wildlife need you! We'll have some supporting gear, but make sure you bring a camera that can film 1080p HD and a tripod. And lest we forget. $100 of your tuition goes specifically into a conservation fund. So, you can leave knowing that you are directly helping wildlife even as you learn skills that will aid your career! Win-win! Just $235 reserves your spot. Ever wondered how folks like Steve Winter and Nick Nichols get those amazing close-up camera-trap images of wildlife? Well, now is your chance to learn how to do it, and start seeking out those intimate wildlife photo experiences for yourself. Join my colleague Sebastian Kennerknecht (PumaPix) and me for an immersive training program in Panama's Cocobolo Nature Reserve. From snow leopards in the Himalayas to fishing cats in Thailand, we've had a lot of experience wrangling DSLR camera traps. Why should we have all the fun? Equipment is provided, and we'll have the latest triggers from Camtraptions as well as Cognisys at your disposal. You'll also learn all sorts of skills from tracking, ecology and general wildlife photography. Rumor has it that some cool cats have been spotted on the trail cams, but there's all sorts of incredible wildlife out there! Hurry before the remaining spots fill! Each trip limited to 6 people. You've got not one, but two opportunities to snag a spot on what's sure to be a wildlife trip of a lifetime. Imagine floating on a boat at sunrise, only to see a jaguar emerge from the forest to chase a caiman, or you know, just looking handsome! Bone up on your wildlife photo skills, learn some new tips and tricks while observing a world-renowned wildlife spectacle. 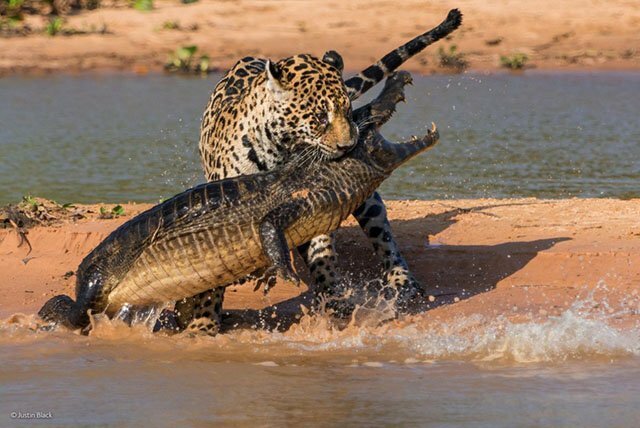 The Pantanal is one of the most wildlife accessible environments on Earth with an incredible array of species from hyacinth macaws, toucans, capybaras, giant anteaters, ocelots, and of course the star of the trip, the magnificent jaguar. This is one of Visionary Wild's longest running and most popular trips. Trip one will be lead alongside Visionary Wild founder Justin Black. Trip two will be the first all-women led excursion with my fellow iLCP senior fellow, the wonderful Michele Westmorland!